I see a lot of Wi-Fi sockets or plugs etc, but no one ever mentions how much power they consume themselves. They are typically connected to Wi-Fi constantly, waiting for commands. Does this not take power? I know it's probably (hopefully) less than the device whose standby we are trying to reduce, but has anyone tested the power usage of smart plugs or switches? I know there are many different types, but is there a difference in usage between low cost knockoffs and big brand smart switches? What about those ones that use normal remote controls that are usable without Wi-Fi? Usually RF signals, also using some amount of power constantly right? Wi-Fi outlets are at about 1.5-2 Watts of power consumption, that's the WeMo as mentioned in Jim's answer, and also a few other ones I've tried, like the TP HS110. ZigBee outlets like the one from Samsung SmartThings should use less power due to the ZigBee protocol usage. According to their support forums, it's about 0.3W when the relay is off and 0.6W when it's on. SmartThings Community. My own old infrared controlled outlets draw even more power than the ZigBee ones, they need about 0.7W. Anyways, that's still less then the Wi-Fi outlets. However, you might need a hub for ZigBee devices which uses up all that saved power. Wi-Fi devices can often forgo such hubs and can be directly controlled via App or Alexa and the like. Thus, you should consider your use case. If you just want to remote control a handful you might use ZigBee/IR and a designated remote, if you want more those Wi-Fi sockets might be less power consuming after all. To understand better the power consumption of smart plugs it's worth peeking into them. To do so let's see some smart plug reference designs. As you can see the parts of these two different designs are quite the same. There is an AC/DC power supply which provides the DC voltage for the sub-circuits. There is a "brain", a Wi-Fi enabled microcontroller unit. The ATSAMW25 and the CC3200. There are some dedicated hardware for power measurement. A relay to be able to switch the mains lines. Some feedback LED and buttons to interface the plug locally. Basically the power consumption of the plug itself is the total power consumption of these parts. The main consumers are the Wi-Fi enabled microcontrollers, the relays and I believe that the LEDs consume more than the metering parts. On the top of these comes the efficiency of the AC/DC power supply, there will be a certain amount of power loss on these elements. Most of the time the application processor will be in low-power mode with a current consumption between μA and mA. The Wi-Fi will add some more consumption, a couple of mA in its idle state. Of course these parameters can vary for different devices from different manufacturers but roughly the scale is the same. There can be significant losses depending on the relay type. There is loss because of the coil, called coil power. This can be even hundreds of mW (10A, 240 VAC relay 500 - 700 mW coil power, cheapest on Farnell). And there is loss because of the contact resistance (100 mΩ for the previous relay, and with a 10 A load it dissipates some power). More expensive ones have better parameters, there are ones with 50 mΩ resistance for example. I am sure that the low cost knockoff plugs have cheaper relays so possibly consumes somewhat more. Worth noting the couple of mA, but nothing more. This will add a percentage on the top of the overall consumption. Cheaper converters probably have lower efficiency, so a cheap plug would consume more in this case too. 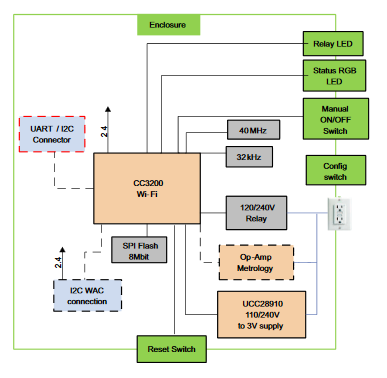 The UCC28910 700V Flyback Switcher from TI's design has a typical of 75% efficiency according to the datasheet (page 30.). There can be worse ones and few better. Again it gives a rough scale. All of these can vary of course but mainly these are the factors that determine the consumption of the device itself. You could calculate a worst-case consumption for TI's design to get a W value. And of course you can check parameters of certain products. A WeMo Rep stated 1.5 Watts for their wall switch on a WeMo forum. I imagine most of these wall/socket switches will draw 1-2 watts in standby. I assume these switches have a similar power usage as an outlet/socket, given their similar functionality. Outlets could be slightly lower, given no need for dimming circuitry. 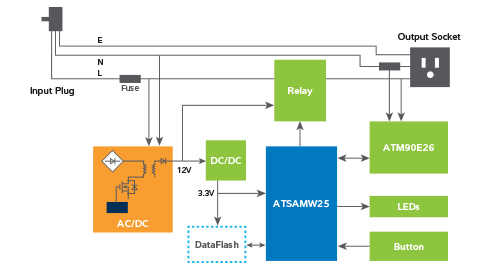 Today, we can build a charger/adapter supply that has <25 mW standby consumption and >82% average efficiency over the full range of load. By the end of the year we expect to be able to do even better than that. We can build a 100W TV supply that has peak efficiency near 90% (no fan required), near-unity power factor, and about 450 mW standby consumption (needed to keep the IR sensor and related components powered up so you can turn it on). It's not unreasonable to expect to see power supplies with average efficiency >90% and near-zero standby. The whole notion that you should be unplugging things to save energy is a bit outdated. Your comment about Wi-Fi is slightly inaccurate. 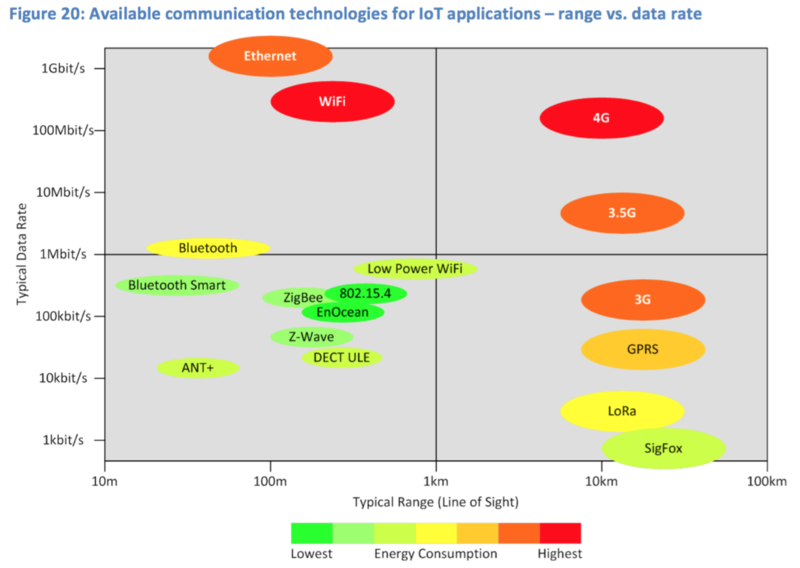 While most of these technologies communicate wirelessly, most do not use 802.11a/b/g/n. Doing so does use a large power drain. I direct you to this International Energy Agency report from 2016. I've included Figure 20 from the report (page 41) below which gives a broad comparison of the technologies. In the case of EnOcean for example, the mechanical energy of pressing the button of a wireless light switch is used for powering the communication to the gateway. Obviously there is no mechanical action to capture energy for an outlet, but it does indicate how low-power the communication is if it can be powered by a light push of your finger. I measured with ELV Energy Master which is known to be quite accurate. Measurement was done when devices were configured and fully booted. Unconfigured TP-Link need more power, AVM was not measured unconfigured. As you see power consumption also depends on Hardware Version of the device. Not the answer you're looking for? Browse other questions tagged power-consumption smart-plugs or ask your own question.